Before an artist tackles a project, often there is the vision of what it will become. Whether it will be a novel, a symphony, or a masterpiece on canvas depends purely on one’s creative inclination. I have such an admiration for the work of Lila Quintero Weaver, who joins me for today’s interview, not only because of her talent as both an author and an illustrator, but also because of the complex subject matter she tackles. Her vision spans multiple mediums, and the end result is thought-provoking. Lila Quintero Weaver is the author-illustrator of Darkroom: A Memoir in Black and White (The University of Alabama Press, 2012), and a children’s novel, to be published in 2018 by Candlewick Press. Publisher’s Weekly called Darkroom, “a vivid, insightful, and moving graphic memoir.” Graphic Novel Reporter wrote: “Stunning, not only for its beautifully rendered imagery but also for its heartfelt story.” The Spanish edition of Darkroom is also coming soon. Kris: Because you’re working with both the text and the illustrations, what does your editing process look like? Lila: Writing and illustrating Darkroom involved a constant gauging of the play between words and images. For the text, I developed a few tricks, such as reading sections aloud to myself, watching for such things as clumsy wording and bumpy transitions. Although I worked closely with my editor, I didn’t have an art director, and doing the illustrations and page layouts called for lots of honest self-assessment. 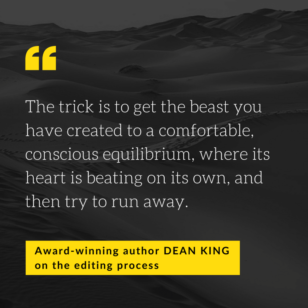 Kris: What is the most critical part of the editing process for you? Lila: Pardon my vernacular, but the old saw that you “shouldn’t polish a turd” is a wise directive. The temptation is to skip straight to the fun stuff—making sentences pretty. 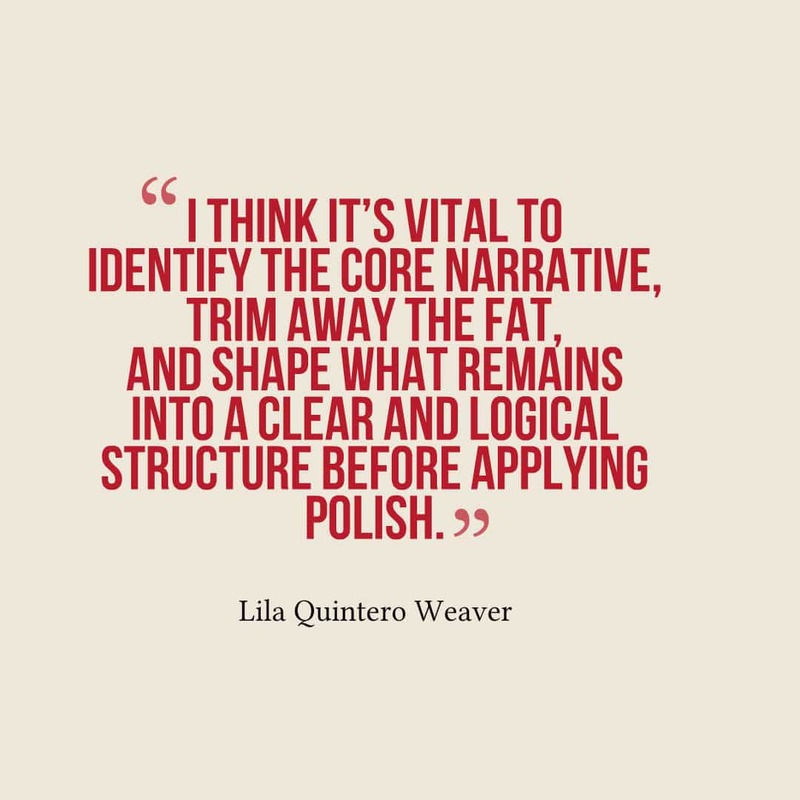 I think it’s vital to identify the core narrative, trim away the fat, and shape what remains into a clear and logical structure before applying polish. Kris: Is time away from your project a necessary part of the process? Lila: Yes, time away works wonders. For whatever reason, our brains adapt to what is on the page and will not readily pinpoint issues without taking a break. Neuroscience must have an explanation for this. Long before trying my hand at writing, I painted portraits. Whenever I found myself struggling to capture a subject’s likeness, I’d leave my studio, close the door, and busy myself with other things, letting a full day pass without looking at the portrait. Amazingly, my first return glimpse would tell me everything I needed to know, and I could immediately correct the problem. 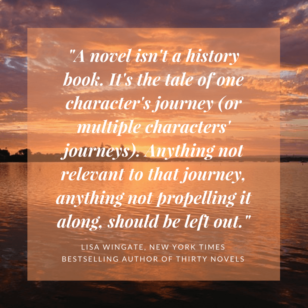 The same trick works for writers, although—to be honest—the turnaround is nowhere near as quick for me, as I’m still learning to see what constitutes good writing. Kris: I love that advice. Walking away can make such a dramatic difference. I find this is especially true with big picture issues—and speaking of the big picture, in Darkroom, where you’re exploring connections between immigration and race, how did keeping in mind this theme influence your final edits? Lila: Once I had laid the story out on the page, I stepped back and tried to imagine how a reader would perceive the organic whole. Did it offer clarity, heart, flow, and solid execution? I relied on literary instinct for the answers, but also on the editing team and my beta readers. I made some last-minute content changes based on their feedback. Kris: Your forthcoming book has a different audience from Darkroom. How does writing for younger readers influence your approach, and how do you double-check that you’ve gotten it right in your late stages? Lila: Yes, Darkroom is not aimed at younger audiences, although kids as young as 11 have told me they enjoyed it. My follow-up project is a middle-grade children’s novel, and writing it has taught me a great deal about adjusting for kid readers. The key was establishing the right voice for my narrator. Somehow, finding her voice helped me access the 12-year-old mentality that still lives deep inside my brain cells. Of course, voice doesn’t excuse lax writing. You still have to deal with the rules of grammar and punctuation. Since my narrator speaks in a regional dialect, replete with colorful idioms and slang, the question became: when is it permissible to dispense with those rules? Between the copyeditor and the manuscript editor, we had a good many such decisions to make. 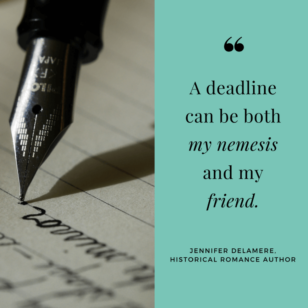 Kris: Outside of the choices you make for your characters, are there any word usage or punctuation issues that still slip into your early drafts from time to time? Lila: I’m a relentless proofreader of my own work and strive to hand in clean copy, but comma placement often gets the best of me. I’m also confused by certain capitalization rules. One example of this is the difference between titles and positions. So you get “Abraham Lincoln, President of the United States,” but you also have “the president of the United States at that time was Abraham Lincoln.” In my writing, I often deal with instances of specific vs. generic references. These are covered by the rules of capitalization, but sometimes it’s not easy to parse how they should be applied. Kris: That’s such a true answer. Capitalization rules do feel more complex than they should be sometimes. Last question for you: is there anything about the revision process that you wish you had known sooner? Lila: Before I became interested in writing, I had no idea that there would be so much building up and tearing down involved. You hear writers refer to “murdering their darlings.” Here’s the metaphor that speaks to me: Writing is like turning a scrawny bush into a shapely topiary. In the early stages of revision, you may need to lop off entire branches, and this can be painful. But by the time you reach the stage of snipping leaves, the end product is in sight and you’ve almost forgotten how hard it was to say goodbye to the deleted material. It helps to keep the goal of revision in mind. We’re trying to give readers a seamless experience. We want branches and leaves to come together in such a full and pleasing shape that nobody suspects how scrawny or unwieldy our first draft was. Isn’t that final metaphor lovely? I can just see the untamed mess of an early project—snarled and full of brambles, overgrown, buggy, Gaia’s worst bed head. Yet when we take the time to tame it, tend to it, and sculpt it, it becomes a work of art. Of course, I only edit in one artistic medium. For those of you working in more, I am impressed and amazed by you. 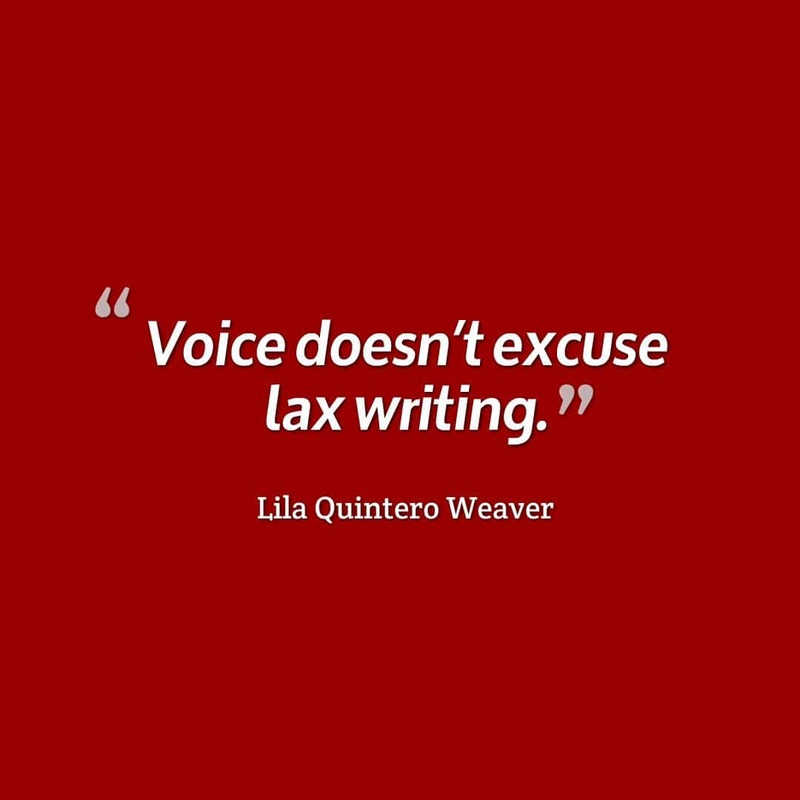 Thank you so much for your time, Lila Quintero Weaver, and happy writing everyone! Join 500+ subscribers and sign-up for my monthly email newsletter for more interviews like this.